Thai-based ready-to-wear label Sretsis has been my favorite label to watch the past few years, and I'm always looking forward to the latest designs. "I Heart U, All Over Again", their 10th collection, features Sretsis' signature mix of hyper-feminine looks, whimsical prints, and unexpected details. The classic heart shape used in this collection is actually a nod to their first, which explored non-traditional and manipulated hearts. The pony used for the clutches and appliques is a rather plain muse compared to the fantastical creatures and elements they've favored in the past, but is still beautiful and majestic on its own. Traditional hearts and simple pony silhouettes combined with dainty barely-there cutouts and streamlined cuts make for a stripped down Sretsis spring/summer collection. Overall, its is very structured and clean, but still very much Sretsis in its execution. 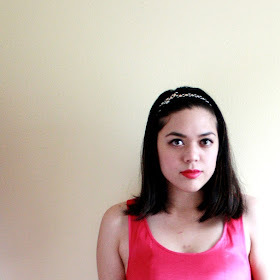 It's made for the sophisticated girly-girl that enjoys a little adventure every now and then. Also, I'm just dying over the shoes. They're chunky suede peep-toe heels with tiny gold arrows stuck in the back of the heels. 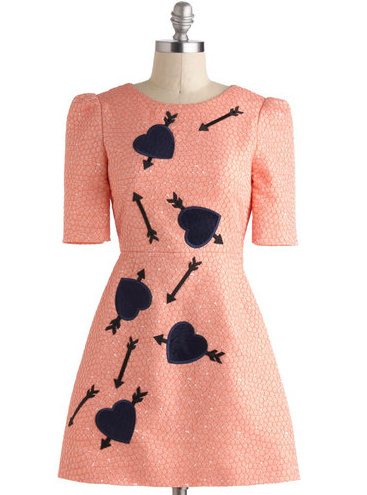 And FYI, I was elated to see the "Lovestruck" heart dress on ModCloth! It's dreamy.